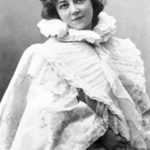 Anna Held known professionally as Anna Held, was a Polish-born French and later Broadway stage performer and singer, most often associated with impresario Florenz Ziegfeld, her common-law husband. "Whatever success I may have attained is due to the fact that since I was old enough to work at all, my ambition has never deserted me." "I do not say anything from jealousy." "My little dog, he did not get ill. It is so funny that people get ill on a boat and dogs do not." "Some women flirt more with what they say, and some with what they do." "At home in Paris I take a milk bath two times a week, but here on the road it is more difficult. I miss them." "How many women have the courage to start properly with a cold, cold bath early in the morning? I jump in, throw the water, cold as ice, and after the first plunge I am happy." "Most women are indulgent of themselves. This is a mistake. It should be only the reward of old age."